As a computer consulting enterprise, Volmar Technologies provides professional business and technology solutions for small-to-medium businesses. They help companies with their computers, networks and network communications, including both hosted and in-house email. 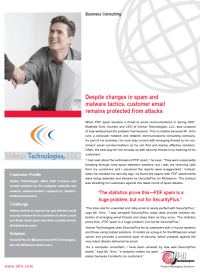 After trying multiple methods, tools and products to protect their users’ mailboxes from spam and virii, Volmar chose SecurityPlus.